Samuel Gustavo Moreno Rojas is a Colombian lawyer and politician, son of former congressman Samuel Moreno Diaz and former presidential candidate Maria Eugenia Rojas Correa, grandson of former Colombian political-military authoritarian leader and ex-president Gustavo Rojas Pinilla. His brother Ivan Moreno Rojas is a former Mayor of Bucaramanga, minister and senator. On October 28, 2007, Moreno Rojas was elected Mayor of Bogota representing the Alternative Democratic Pole for the 2008-2012 term. On 3 May 2011, Moreno was suspended and stripped of his office by the Office of the Inspector General for improprieties in the appropriation of city contracts. 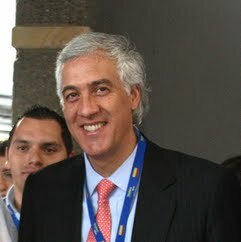 For the same accusations, the Office of the Attorney General of Colombia argued for a pretrial detention, and Moreno was arrested on 23 September 2011.